Explore the world of Hummels - famous throughout the world for their gentle reflection of childhood joys! We offer the entire Collection of M. I. Hummels - with great prices and service, Layaway Plan and Free Shipping! Add to shopping cart for 50% discount - entire site! M.I. Hummels are the result of a successful partnership between W. Goebel Porzellanfabrik and a talented German artist, Sister Maria Innocentia Hummel. M.I. 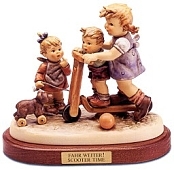 Hummel figurines continue to charm the world. M. I. Hummels are made in Germany.